Remnants from a star that exploded thousands of years ago created a celestial abstract portrait, as captured in this Hubble Space Telescope image of the Pencil Nebula. Officially known as NGC 2736, the Pencil Nebula is part of the huge Vela supernova remnant, located in the southern constellation Vela. Discovered by Sir John Herschel in the 1840s, the nebula's linear appearance triggered its popular name. The nebula's shape suggests that it is part of the supernova shock wave that recently encountered a region of dense gas. It is this interaction that causes the nebula to glow, appearing like a rippled sheet. In this snapshot, astronomers are looking along the edge of the undulating sheet of gas. This view shows large, wispy filamentary structures, smaller bright knots of gas, and patches of diffuse gas. The Hubble Heritage Team used the Advanced Camera for Surveys in October 2002 to observe the nebula. 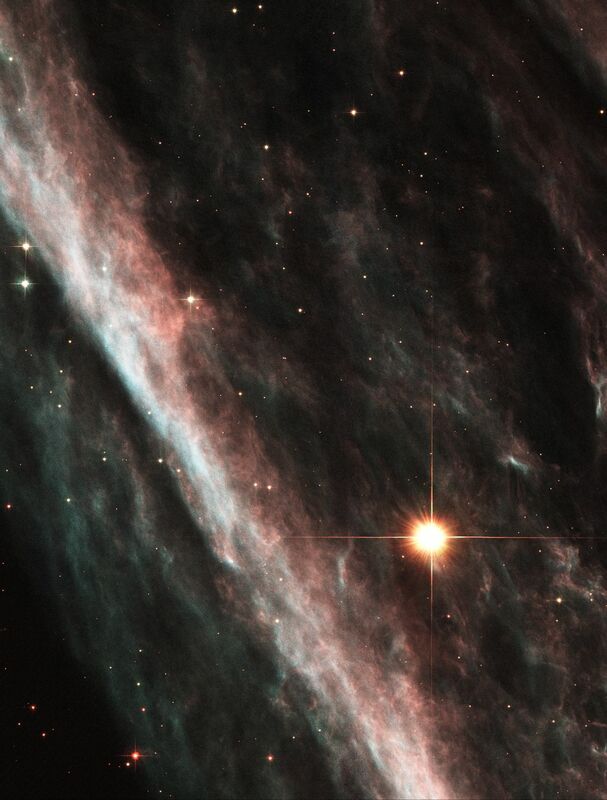 The region of the Pencil Nebula captured in this image is about three fourths of a light-year across. The Vela supernova remnant is 114 light-years (35 parsecs) across. The remnant is about 815 light-years (250 parsecs) away from our solar system. The nebula's luminous appearance comes from dense gas regions that have been struck by the supernova shock wave. As the shock wave travels through space [from right to left in the image], it rams into interstellar material. Initially the gas is heated to millions of degrees, but then subsequently cools down, emitting the optical light visible in the image. The colors of the various regions in the nebula yield clues about this cooling process. Some regions are still so hot that the emission is dominated by ionized oxygen atoms, which glow blue in the picture. 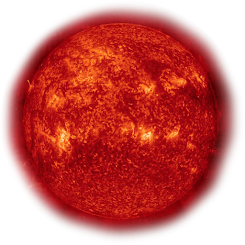 Other regions have cooled more and are seen emitting red in the image (cooler hydrogen atoms). In this situation, color shows the temperature of the gas. The nebula is visible in this image because it is glowing.